We present the case of a one-year old child, with a foot drop for fifteen days. The detailed clinical history revealed a history of intramuscular gluteal injection fifteen days back. The nerve conduction velocity (NCV) and electromyogram (EMG) findings were suggestive of involvement of common peroneal nerve as well as posterior tibial nerve. 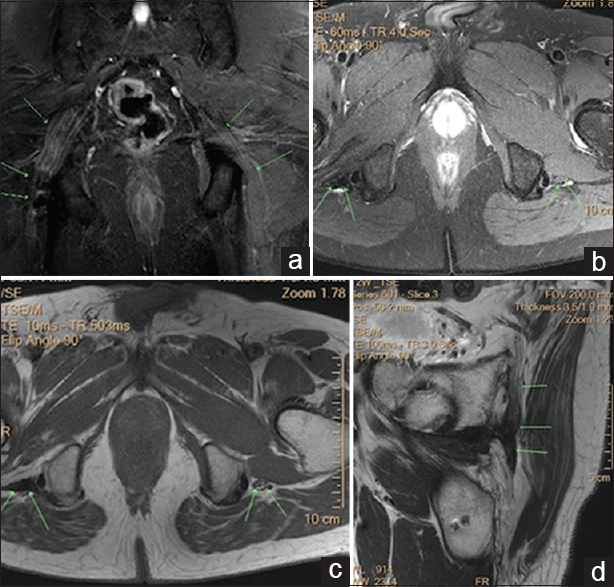 On magnetic resonance imaging (MRI) examination, the T2 weighted FAT SAT (fat saturation) coronal and axial [Figure 1]a and [Figure 1]b images and proton density axial and sagittal oblique [Figure 1]c and [Figure 1]d images revealed a thickened striated sciatic nerve having altered signal intensity in between the gluteus maximus and gluteus medius muscles confirming sciatic nerve injury following gluteal muscle injection. No discontinuity of fibers or a neuroma formation was seen. The features were likely due to neuropraxia. Intragluteal injection is the second most common cause of sciatic nerve injury, the most common one being hip arthroplasty. The injury is commoner in the pediatric population as the child is usually uncooperative. Sciatic nerve courses through the middle of the gluteal region, hence injections should be administered in the upper outer quadrant of the gluteal region. Specially in developing countries, due to the presence of an untrained staff, injections at inappropriate sites commonly leads to this complication. 90% of the patients have an immediate onset of symptoms, while 10% of the patients have a delayed onset of symptoms. This variability is due to the injection site being either intra- or extrafascicular in location, respectively. The symptoms can vary from pain, paresthesia, sensory loss or disturbance, or motor weakness. The diagnosis may be established by a detailed clinical examination, electromyography and imaging studies. In imaging, sciatic neuropathy can be seen as an altered signal intensity of a segment of the sciatic nerve in the gluteal region with nerve thickening or neuroma formation., Secondary signs of denervation may be seen in the muscles supplied by the nerve which are apparent as a hyperintense signal in the muscles supplied by the sciatic nerve. MR imaging can also help in prognosticating the nerve injury. When there is diffuse thickening of the nerve with signal alteration, recovery is usually complete. If there is formation of a neuroma in continuity, recovery is incomplete/poor. No recovery is expected if there is end neuroma formation or compete transaction of the nerve., The treatment options vary depending upon the severity of symptoms and can range from pain killers, physiotherapy, braces or operative exploration. Aggarwal A, Srivastava DN, Jana M, Sharma R, Gamanagatti S, Kumar A, et al. World Neurosurg 2017;108:185-200. Jung Kim H, Hyun Park S. Sciatic nerve injection injury. J Int Med Res 2014;42:887-97. Chhabra A, Williams EH, Wang KC. MR neurography of neuromas related to nerve injury and entrapment with surgical correlation. AJNR Am J Neuroradiol 2010;31:1363-68. Kumar A, Shukla D, Bhat DI, Indira Devi B. Iatrogenic peripheral nerve injuries. Neurol India 2019;67:S135-9. Chhabra A, Ahlawat S, Belzberg A, Andreseik G. Peripheral nerve injury grading simplified on MR neurography: As referenced to Seddon and Sunderland classifications. Indian J Radiol Imaging 2014;24:217-24.